A transjugular intrahepatic portosystemic shunt (TIPS) is a percutaneously created connection within the liver between the portal and systemic circulations. A TIPS is placed to reduce portal pressure in patients with complications related to portal hypertension. [1, 2] This procedure has emerged as a less invasive alternative to surgery in patients with end-stage liver disease. See the images below. Basic transjugular intrahepatic portosystemic shunt (TIPS) procedure. Image demonstrates advancement of a Colapinto needle into the right portal vein. The goal of TIPS placement is to divert portal blood flow into the hepatic vein, so as to reduce the pressure gradient between portal and systemic circulations. Shunt patency is maintained by placing an expandable metal stent across the intrahepatic tract. In 1969, Rosch first described the establishment of a percutaneous tract between the portal vein (PV) and the hepatic vein from a jugular approach. He used serial dilators to create a shunt within the liver and advocated the use of silicone tubing across the hepatic parenchyma to create a functional shunt. Further progress was made in 1977, with the work of Reich and coworkers, who used a 9-mm cryoprobe to create larger parenchymal tract in a swine model. These early pioneers realized that intraparenchymal tracts, either unsupported or supported with a silastic stent, had poor patency and were usually complicated by complete occlusion within a short period. Colapinto reported the first clinical use of transjugular intrahepatic portosystemic shunt in a patient with cirrhosis that involved a 12-mm angioplasty balloon to expand the intrahepatic tract. However, this technique also resulted in poor patency. Long-term TIPS patency was not accomplished until the introduction of metallic stents in the 1980s. This resulted in the establishment of TIPS as a percutaneous alternative to the surgical portosystemic shunts. The TIPS procedure has gained worldwide acceptance. Technical refinements have resulted in reduced morbidity and improved clinical success. At the author's institution, all potential patients for TIPS placement undergo preoperative evaluation with duplex sonography to determine if the PV is patent. If the Doppler sonographic findings are inconclusive, arterial portography via the splenic or superior mesenteric arteries can be performed to evaluate PV anatomy and patency. In the presence of reversed intrahepatic portal flow, the PV may not fill during arterial portography, however. Magnetic resonance venography may have a role in assessing PV patency prior to TIPS. An alternative approach in a patient with inconclusive sonograms can be wedged hepatic venography with CO2 from the jugular vein. Patients with cirrhosis often have coagulopathy, and severe coagulopathy should be addressed prior to any invasive procedure. Platelets are routinely administered when platelet counts are less than 50,000 mm3, and fresh frozen plasma (FFP) is used with an international normalized ratio (INR) greater than 2.0. Most patients can safely undergo transjugular intrahepatic portosystemic shunt placement with intravenous conscious sedation involving short-acting benzodiazepines and opiates. Some institutions prefer general anesthesia during TIPS procedures because of the prolonged nature of the procedure and the degree of discomfort that many patients experience during the transvenous punctures. The technique is fairly standard and has been well described in the scientific literature, with some minor variations related to the interventionalist or the center at which the procedure is performed. Colapinto transjugular cholangiography liver biopsy set (Cook). This includes a 16-gauge Colapinto puncture needle. Rosch-Uchida transjugular liver access set (Cook). This includes a 14-gauge needle with a trocar. Angiodynamics transjugular access set (Angiodynamics). With standard catheter exchange, a 5F catheter with a multipurpose curve is placed into the right hepatic vein. The catheter is wedged in a peripheral branch of the right hepatic vein. Wedged hepatic venography is then performed with carbon dioxide gas to opacify the portal venous system. See the images below. Basic transjugular intrahepatic portosystemic shunt (TIPS) procedure. A wedged hepatic venogram obtained by using the digital subtraction technique obtained with CO2 gas demonstrates the location of the portal vein. The catheter is wedged in a branch of the right hepatic vein. Typically, a 50-mL manual injection of CO2 is used. This procedure usually demonstrates the location of the main PV, as well as that of the left and right branches. Frequently, more than one CO2 injection is required to obtain a good portogram. If wedged injection fails to fill the PV, an occlusion balloon catheter may be used. Biplane CO2 wedged hepatic venograms and biplane fluoroscopy can be used. By using the wedged hepatic venogram images as a guide, the Colapinto needle is advanced through the wall of the right hepatic vein and directed in an anteroinferior direction to access the right PV. See the image below. Some have advocated injecting CO2 as the 21-gauge fine needle is advanced through the liver to more definitively guide the puncture. Once the portal vein has been cannulated, CO2 is injected into the parenchymal tract to exclude transgression of the bile duct or hepatic artery. If the bile duct has been transgressed, the access may be abandoned; or if a small branch has been transgressed, a covered stent such as the Gore VIATORR TIPS Endoprosthesis is placed. 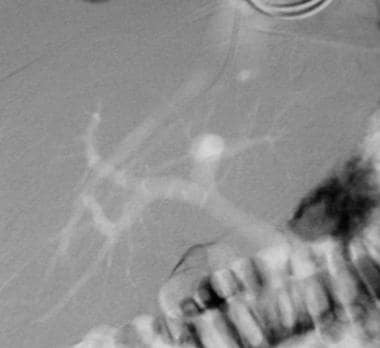 If a good wedged venogram cannot be obtained, selection of an appropriate site for puncture from the hepatic vein to PV is accomplished with a thorough understanding of the hepatic anatomy. The right hepatic vein lies superior and posterior to the PV bifurcation, and the right PV usually courses lateral to the T11 vertebral body. The portal bifurcation may be extrahepatic in a large percentage of patients. An extrahepatic puncture can lead to life-threatening hemorrhage, whereas puncture of a peripheral portal venous branch can create an angle that is too acute for successful TIPS placement. From the right hepatic vein, the needle is usually aimed anteromedially and caudally then advanced 3-4 cm within the liver. Several punctures may be necessary for success. Large-volume paracentesis before TIPS in a patient with massive ascites can facilitate cannulation of the hepatic vein and puncture of the PV. The needle is gently aspirated as it is withdrawn across the parenchymal tract. Once portal venous blood is freely aspirated, contrast material is injected through the needle to verify the point of entry into the vessel. An intrahepatic access site with entry into the right PV at least 1 cm from the main PV bifurcation is desired. A guidewire and catheter are advanced into the PV, and portal venography is performed. Pressure measurements are obtained in the PV as well as in the right atrium. The difference between the measured pressures yields the portosystemic gradient. If the pressure gradient is significantly elevated (>12 mm Hg), the TIPS is placed. If the gradient is not elevated, the presence of a competitive shunt, such as a spontaneous splenorenal shunt, must be evaluated. The spontaneous shunts can be used to lower the portosystemic gradient, but they are not true vessels and lack normal vascular integrity, which poses a risk for rupture. The intrahepatic parenchymal tract is dilated with an 8- or 10-mm high-pressure balloon such as Conquest high-pressure balloon (Bard). Images of the initial balloon waist are saved because they demonstrate the locations of the PV entry site and the hepatic vein exit site. A self-expanding metallic stent, such as the Wallstent (Boston Scientific), is then deployed across the tract and dilated to the desired diameter by using an angioplastic balloon. See the image below. Basic transjugular intrahepatic portosystemic shunt (TIPS) procedure. A TIPS (10 X 68 mm Wallstent dilated with 10 mm X 4 cm balloon) has been placed. Note flow through the Wallstent and filling of the splenorenal shunt. The intrahepatic portal flow became reversed after TIPS placement. Proper stent placement is crucial, especially if the patient is undergoing subsequent orthotopic liver transplantation. The stent should form a smooth and gentle curve and must extend adequately into the portal and hepatic veins. Overextension of a stent into the PV, hepatic vein, or inferior vena cava can be problematic for the transplant surgeon. The Wallstent significantly shortens as it is deployed, and the ability to predict and achieve appropriate final stent placement improves with experience. Self-expanding nitinol stents minimally shorten with deployment are also available from multiple manufacturers, and the use of one of these may be helpful for more predictable stent placement. The stent may need to be dilated 8-12 mm, depending on the indication for TIPS and the stent used. Postplacement venography is performed and pressures are measured to confirm adequate stent positioning, good flow through the TIPS, and reduction in the portosystemic gradient. If needed, additional stent placement or further balloon dilation can be performed to obtain a final portosystemic gradient of 8-12 mm Hg. Postplacement venography revealing persistent variceal filling indicates that insufficient decompression has been achieved with the stent. These varices can be selectively catheterized and embolized with coils. A large number of complications can occur during and after placement of a TIPS. [17, 18] Complications related to the puncture site include pneumothorax, vessel or tissue injury, and arteriovenous fistula formation. Ultrasonographic guidance for the jugular puncture can minimize these complications. Placement of the catheter in the right atrium can cause serious cardiac dysrhythmias. Cardiac monitoring should be continued throughout the TIPS procedure and during the initial postprocedural period. Complications can occur during the creation of the intrahepatic tract. The needle can injure the hepatic artery or bile ducts. Capsular tears can result in life-threatening hemorrhage when they occur in association with a hepatic artery puncture. Portal venous puncture in an extrahepatic location can result in significant bleeding complications. 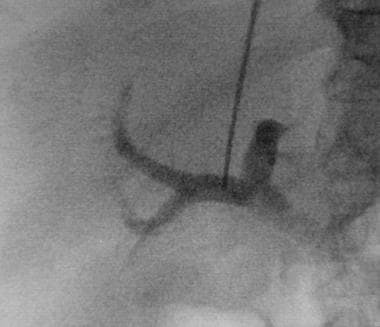 Puncture of the right PV at least 1-2 cm distal to the PV bifurcation more often than not assures that an intrahepatic TIPS has been created. A major concern of a newly placed TIPS is new-onset or worsened encephalopathy, which occurs in about 25% of treated patients. [19, 20] Patients with preprocedural hepatic encephalopathy or Child class C cirrhosis are more likely to have this complication. Shunt diameter and degree of portosystemic gradient reduction are related to the development of encephalopathy. Most often, hepatic encephalopathy can be medically treated with lactulose and dietary protein restriction, although shunt revision to a smaller diameter or intentional shunt thrombosis may be necessary. Patients often have hepatic encephalopathy immediately after shunt placement, and symptoms diminish as the shunt undergoes fibrous changes and resultant narrowing over time. Aside from hepatic encephalopathy, the second most common complication associated with TIPS placement is shunt stenosis and occlusion. Early shunt thrombosis (often within 24 h) is usually believed to be secondary to extension of the intrahepatic tract across a bile duct. Such early shunt occlusions can be treated with balloon dilation of the stent. The use of covered (polytetrafluoroethylene [PTFE], polyester) stents to improve primary and secondary shunt patency may prove helpful. If direct PV and right atrial pressures (measured to determine the portosystemic gradient) show a less-than-expected gradient, a competitive shunt (spontaneous splenorenal or large varices) should be excluded by advancing the catheter into the splenic or mesenteric vein and injecting bolus of contrast agent with digital imaging. Competitive shunts can be selectively embolized with coils, if necessary. Although the shunts may decrease the portosystemic gradient, they are thin walled and can spontaneously rupture, causing life-threatening hemorrhage. If no competitive shunt is found and if the gradient is less than 12 mm Hg, TIPS is not indicated, and alternative explanations for the bleeding should be sought. Upper GI bleeding may be related to a cause other than portal hypertension in as many as 25% of cases. See the image below. Basic transjugular intrahepatic portosystemic shunt (TIPS) procedure. Coil embolization of the splenorenal shunt has been performed. An 8-mm diameter stent is usually acceptable in patients with refractory ascites, whereas a 10-12 mm shunt may be needed in patients with life-threatening hemorrhage. Wallstents can be overdilated to about 10% larger than their nominal diameter to allow further gradient reduction. Nitinol stents cannot be overdilated in this way. In some cases, 2 parallel shunts are required to effectively lower the portosystemic gradient. Most commonly, TIPS results in complete reversal of intrahepatic PV flow and markedly reduces variceal blood flow. Balloon angioplasty used to treat hyperplasia. Patients with active bleeding during the procedure also have increased early mortality. The 30-day mortality rates are 3-30%; the variation in the range is related to the preprocedural Child classification and whether the procedure was performed on an emergent or elective basis. [13, 33, 34, 35] In 1995, LaBerge et al reported that cumulative survival rates in patients with Child grades of A, B, and C, respectively, were 75%, 68%, and 49% at 1 year and 75%, 55%, and 43% at 2 years. Surveillance ultrasonography is performed at the author's institution at 3 and 6 months after the procedure and twice yearly thereafter. If clinical evidence of TIPS malfunction is present, ultrasonography may be performed more frequently. TIPS placement is an effective means of lowering portal venous pressure and controlling acute and recurrent variceal bleeding. The shunt can be placed in almost all patients who require portal decompression. Procedural times have decreased, and success rates have increased with operator experience. Unlike surgically placed shunts, TIPS does not alter the extrahepatic anatomy; therefore, it remains a feasible nonsurgical alternative in many patients, and it is particularly effective as a bridge to liver transplantation. Colombato L. The role of transjugular intrahepatic portosystemic shunt (TIPS) in the management of portal hypertension. J Clin Gastroenterol. 2007 Nov-Dec. 41 Suppl 3:S344-51. [Medline]. Gaba RC, Omene BO, Podczerwinski ES, Knuttinen MG, Cotler SJ, Kallwitz ER, et al. TIPS for Treatment of Variceal Hemorrhage: Clinical Outcomes in 128 Patients at a Single Institution over a 12-Year Period. J Vasc Interv Radiol. 2011 Dec 16. [Medline]. Bettinger D, Knüppel E, Euringer W, Spangenberg HC, Rössle M, Thimme R, et al. Efficacy and safety of transjugular intrahepatic portosystemic shunt (TIPSS) in 40 patients with hepatocellular carcinoma. Aliment Pharmacol Ther. 2014 Oct 20. [Medline]. Rosch J, Hanafee WN, Snow H. Transjugular portal venography and radiologic portacaval shunt: an experimental study. Radiology. 1969 Apr. 92(5):1112-4. [Medline]. Reich M, Olumide F, Jorgensen E. Experimental cryoprobe production of intrahepatic portocaval shunt. J Surg Res. 1977 Jul. 23(1):14-8. [Medline]. Colapinto RF, Stronell RD, Gildiner M. Formation of intrahepatic portosystemic shunts using a balloon dilatation catheter: preliminary clinical experience. AJR Am J Roentgenol. 1983 Apr. 140(4):709-14. [Medline]. Ferral H, Gomez-Reyes E, Fimmel CJ. Post-Transjugular Intrahepatic Portosystemic Shunt Follow-Up and Management in the VIATORR Era. Tech Vasc Interv Radiol. 2016 Mar. 19 (1):82-8. [Medline]. Shiffman ML, Jeffers L, Hoofnagle JH. The role of transjugular intrahepatic portosystemic shunt for treatment of portal hypertension and its complications: a conference sponsored by the National Digestive Diseases Advisory Board. Hepatology. 1995 Nov. 22(5):1591-7. [Medline]. Salerno F, Cammà C, Enea M, Rössle M, Wong F. Transjugular intrahepatic portosystemic shunt for refractory ascites: a meta-analysis of individual patient data. Gastroenterology. 2007 Sep. 133(3):825-34. [Medline]. Olliff SP. Transjugular intrahepatic portosystemic shunt in the management of Budd Chiari syndrome. Eur J Gastroenterol Hepatol. 2006 Nov. 18(11):1151-4. [Medline]. Pinter SZ, Rubin JM, Kripfgans OD, Novelli PM, Vargas-Vila M, Hall AL, et al. Volumetric blood flow in transjugular intrahepatic portosystemic shunt revision using 3-dimensional Doppler sonography. J Ultrasound Med. 2015 Feb. 34 (2):257-66. [Medline]. LaBerge JM, Somberg KA, Lake JR. Two-year outcome following transjugular intrahepatic portosystemic shunt for variceal bleeding: results in 90 patients. Gastroenterology. 1995 Apr. 108(4):1143-51. [Medline]. LaBerge JM, Ferrell LD, Ring EJ. Histopathologic study of stenotic and occluded transjugular intrahepatic portosystemic shunts. J Vasc Interv Radiol. 1993 Nov-Dec. 4(6):779-86. [Medline]. LaBerge JM, Ring EJ, Gordon RL. Creation of transjugular intrahepatic portosystemic shunts with the wallstent endoprosthesis: results in 100 patients. Radiology. 1993 May. 187(2):413-20. [Medline]. Tripathi D, Ferguson J, Barkell H, Macbeth K, Ireland H, Redhead DN, et al. Improved clinical outcome with transjugular intrahepatic portosystemic stent-shunt utilizing polytetrafluoroethylene-covered stents. Eur J Gastroenterol Hepatol. 2006 Mar. 18(3):225-32. [Medline]. Clark W, Golkar F, Luberice K, Toomey P, Paul H, Marcadis A, et al. Uncovering the truth about covered stents: is there a difference between covered versus uncovered stents with transjugular intrahepatic portosystemic shunts?. Am J Surg. 2011 Nov. 202(5):561-4. [Medline]. Freedman AM, Sanyal AJ, Tisnado J. Complications of transjugular intrahepatic portosystemic shunt: a comprehensive review. Radiographics. 1993 Nov. 13(6):1185-210. [Medline]. Bala TM, Panda M. Cardiac perforation and tamponade: a potentially fatal complication during transjugular intrahepatic portosystemic shunt placement. South Med J. 2006 Sep. 99(9):1000-2. [Medline]. Sanyal AJ, Freedman AM, Luketic VA. Transjugular intrahepatic portosystemic shunts compared with endoscopic sclerotherapy for the prevention of recurrent variceal hemorrhage. A randomized, controlled trial. Ann Intern Med. 1997 Jun 1. 126(11):849-57. [Medline]. Sanyal AJ, Freedman AM, Shiffman ML. Portosystemic encephalopathy after transjugular intrahepatic portosystemic shunt: results of a prospective controlled study. Hepatology. 1994 Jul. 20(1 Pt 1):46-55. [Medline]. Masson S, Mardini HA, Rose JD, Record CO. Hepatic encephalopathy after transjugular intrahepatic portosystemic shunt insertion: a decade of experience. QJM. 2008 Jun. 101(6):493-501. [Medline]. Quiroga J, Sangro B, Nunez M. Transjugular intrahepatic portal-systemic shunt in the treatment of refractory ascites: effect on clinical, renal, humoral, and hemodynamic parameters. Hepatology. 1995 Apr. 21(4):986-94. [Medline]. Saugel B, Phillip V, Gaa J, Berger H, Lersch C, Schultheiss C, et al. Advanced Hemodynamic Monitoring before and after Transjugular Intrahepatic Portosystemic Shunt: Implications for Selection of Patients--A Prospective Study. Radiology. 2012 Jan. 262(1):343-52. [Medline]. Bettinger D, Schultheiss M, Boettler T, Muljono M, Thimme R, Rössle M. Procedural and shunt-related complications and mortality of the transjugular intrahepatic portosystemic shunt (TIPSS). Aliment Pharmacol Ther. 2016 Nov. 44 (10):1051-1061. [Medline]. Lee EW, Kuei A, Saab S, Busuttil RW, Durazo F, Han SH, et al. Nationwide trends and predictors of inpatient mortality in 83884 transjugular intrahepatic portosystemic shunt. World J Gastroenterol. 2016 Jul 7. 22 (25):5780-9. [Medline]. Rozenblit G, DelGuercio LR, Savino JA. Transmesenteric-transfemoral method of intrahepatic portosystemic shunt placement with minilaparotomy. J Vasc Interv Radiol. 1996 Jul-Aug. 7(4):499-506. [Medline]. Henderson JM, Boyer TD, Kutner MH, Galloway JR, Rikkers LF, Jeffers LJ, et al. Distal splenorenal shunt versus transjugular intrahepatic portal systematic shunt for variceal bleeding: a randomized trial. Gastroenterology. 2006 May. 130(6):1643-51. [Medline]. Tripathi D, Hayes PC. Endoscopic therapy for bleeding gastric varices: to clot or glue?. Gastrointest Endosc. 2008 Nov. 68(5):883-6. [Medline]. Tripathi D, Jalan R. Transjugular intrahepatic portosystemic stent-shunt in the management of gastric and ectopic varices. Eur J Gastroenterol Hepatol. 2006 Nov. 18(11):1155-60. [Medline]. Crenshaw WB, Gordon FD, McEniff NJ. Severe ascites: efficacy of the transjugular intrahepatic portosystemic shunt in treatment. Radiology. 1996 Jul. 200(1):185-92. [Medline]. Guo J, Büning C, Schott E, Kröncke T, Braun J, Sack I, et al. In vivo abdominal magnetic resonance elastography for the assessment of portal hypertension before and after transjugular intrahepatic portosystemic shunt implantation. Invest Radiol. 2015 May. 50 (5):347-51. [Medline]. Rubin RA, Haskal ZJ, O''Brien CB. Transjugular intrahepatic portosystemic shunting: decreased survival for patients with high APACHE II scores. Am J Gastroenterol. 1995 Apr. 90(4):556-63. [Medline]. Haskal ZJ, Middlebrook MR. Creation of a stenotic stent to reduce flow through a transjugular intrahepatic portosystemic shunt. J Vasc Interv Radiol. 1994 Nov-Dec. 5(6):827-9; discussion 829-30. [Medline]. Haskal ZJ, Pentecost MJ, Soulen MC. Transjugular intrahepatic portosystemic shunt stenosis and revision: early and midterm results. AJR Am J Roentgenol. 1994 Aug. 163(2):439-44. [Medline]. Rossle M, Haag K, Ochs A. 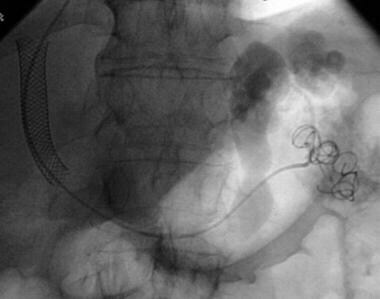 The transjugular intrahepatic portosystemic stent-shunt procedure for variceal bleeding. N Engl J Med. 1994 Jan 20. 330(3):165-71. [Medline]. Dodd GD 3rd, Zajko AB, Orons PD. Detection of transjugular intrahepatic portosystemic shunt dysfunction: value of duplex Doppler sonography. AJR Am J Roentgenol. 1995 May. 164(5):1119-24. [Medline]. Kanterman RY, Darcy MD, Middleton WD. Doppler sonography findings associated with transjugular intrahepatic portosystemic shunt malfunction. AJR Am J Roentgenol. 1997 Feb. 168(2):467-72. [Medline]. Bannas P, Roldán-Alzate A, Johnson KM, Woods MA, Ozkan O, Motosugi U, et al. Longitudinal Monitoring of Hepatic Blood Flow before and after TIPS by Using 4D-Flow MR Imaging. Radiology. 2016 Nov. 281 (2):574-582. [Medline]. Haskal ZJ, Martin L, Cardella JF. Quality improvement guidelines for transjugular intrahepatic portosystemic shunts. SCVIR Standards of Practice Committee. J Vasc Interv Radiol. 2001 Feb. 12(2):131-6. [Medline]. Kerlan RK Jr, LaBerge JM, Baker EL. Successful reversal of hepatic encephalopathy with intentional occlusion of transjugular intrahepatic portosystemic shunts. J Vasc Interv Radiol. 1995 Nov-Dec. 6(6):917-21. [Medline]. Kerlan RK Jr, LaBerge JM, Gordon RL. Transjugular intrahepatic portosystemic shunts: current status. AJR Am J Roentgenol. 1995 May. 164(5):1059-66. [Medline]. Otal P, Smayra T, Bureau C. Preliminary results of a new expanded-polytetrafluoroethylene-covered stent-graft for transjugular intrahepatic portosystemic shunt procedures. AJR Am J Roentgenol. 2002 Jan. 178(1):141-7. [Medline]. Quaretti P, Michieletti E, Rossi S. Successful Treatment of TIPS-induced Hepatic Failure with an Hourglass Stent-Graft: A Simple New Technique for Reducing Shunt Flow. J Vasc Interv Radiol. 2001 Jul. 12(7):887-90. [Medline]. Ring EJ, Lake JR, Roberts JP. Using transjugular intrahepatic portosystemic shunts to control variceal bleeding before liver transplantation. Ann Intern Med. 1992 Feb 15. 116(4):304-9. [Medline]. Schultz SR, LaBerge JM, Gordon RL. Anatomy of the portal vein bifurcation: intra- versus extrahepatic location--implications for transjugular intrahepatic portosystemic shunts. J Vasc Interv Radiol. 1994 May-Jun. 5(3):457-9. [Medline]. Wilson MW, Gordon RL, LaBerge JM. Liver transplantation complicated by malpositioned transjugular intrahepatic portosystemic shunts. J Vasc Interv Radiol. 1995 Sep-Oct. 6(5):695-9. [Medline]. Basic transjugular intrahepatic portosystemic shunt (TIPS) procedure. 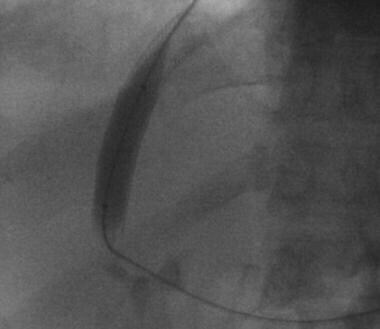 Portal venogram obtained with a pigtail catheter shows filling of the coronary vein. Basic transjugular intrahepatic portosystemic shunt (TIPS) procedure. 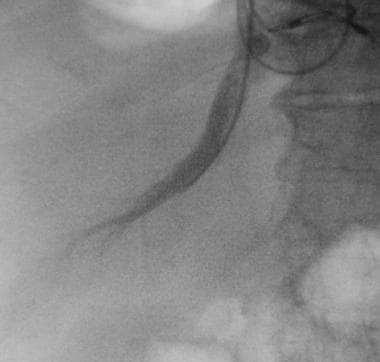 Delayed venogram demonstrates filling of large varices. Early transjugular intrahepatic portosystemic shunt (TIPS) thrombosis. 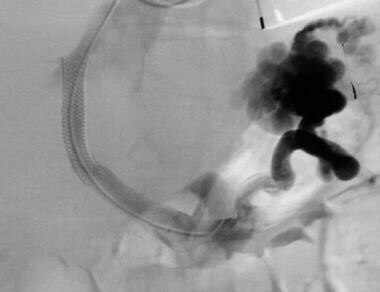 Image obtained after placement of the initial TIPS shows good flow through the shunt. Early transjugular intrahepatic portosystemic shunt (TIPS) thrombosis. Sonogram obtained the day after shunt placement demonstrates thrombosis. The catheter was placed through the thrombosed TIPS without any difficulty. Note the absence of flow through the shunt and the hepatopetal portal flow. Early transjugular intrahepatic portosystemic shunt (TIPS) thrombosis. After recanalization of the shunt, a Wallgraft is placed within it. Early transjugular intrahepatic portosystemic shunt (TIPS) thrombosis. Good flow is restored through the TIPS after placement of the Wallgraft. A parallel transjugular intrahepatic portosystemic shunt (TIPS) required in this patient to effectively decrease the portosystemic gradient. Hyperplasia within a transjugular intrahepatic portosystemic shunt (TIPS) several months after placement. Final appearance of the transjugular intrahepatic portosystemic shunt (TIPS) after balloon dilation (see also Image 14). Cirrhosis and Surgery: How Do We Prevent Unnecessary Risk in These Vulnerable Patients?